In this podcast, Franki Sibberson chats with Cris Tovani about using a reading workshop model with high school students. A full transcript of the podcast is available below the player. Franki: Cris, you worked with kids in grades 1 thru 12. How does the workshop model support kids at all ages and stages of literacy development? Cris: Well I’ve been really lucky to get to work with kids at all different levels and I think what I’ve noticed with secondary students is just workshop model allows teachers to address specific needs of kids. It lets kids who are further along to work at a faster pace. It also gives the teacher an opportunity to differentiate instruction. And I think with high school kids especially there’s this huge rub between covering content and principals wanting to see student engagement. And so I think workshop model is a planning structure that allows both to happen. Franki: And so what do you think the most powerful thing about a workshop is? Cris: Well this year I’m in a new high school. After 14 years I moved and I moved across town to the most diverse high school in the state of Colorado. And pretty high poverty rate. I am not teaching any reading classes in this building but I’m doing English classes. That’s been a really learning curve for me because I’ve acquired texts that I’m supposed to teach but I know how important having choice is when it comes to driving engagement. And so I’m trying to figure out how to teach a required anchor text using companion pieces of all different text structures and then having three weeks of free choice following that required anchor text. And what I’m noticing is students’ free choice reading is kind of bleeding into the next anchor text that we read. Franki: Can you talk a little bit about your schedule and how you run a workshop with the high school schedule that you have? Cris: So my schedule for this year is similar to what I had been teaching. I teach on a block schedule which means that I have kids 100 minutes every other day. On days I don’t have kids I get to do some literacy coaching around the district. The days I do have kids I have them for the 90 minutes and one of the classes that I teach is 9th grade English and then the other prep I have is 11th grade American Lit. And I try to run two workshops within that 100 minutes. I try to do a reading workshop and I try to do a writing workshop. So every day I’m trying to teach something about reading literature and non-fiction and then writing. Sometimes they’re writing a learning analysis, sometimes they’re writing pieces of text. Like right now my juniors are working on letters to incoming 8th graders and they’re kind of talking about their entry in high school and they’re gonna have this legacy that they’ll get to leave. So the juniors are kind of giving them some words of wisdom. Franki: So how does the day work when they walk in? What are the components of your day? Cris: When the kids walk in what’s nice about workshop models is that there’s systems and structures in place and so as kids walk in I’ve got those conversation calendars on their desks. So they read what I wrote back to them from the previous class. And then on the board I’m starting to work with learning targets. I’ve been reading a lot about reading targets from Rick Stiggins works so on the board every day are our learning goals and then right next to those learning goals are how I’m going to assess how well they’ve understood them. So for example, one of the learning targets might be I can annotate in a variety of ways or I can ask a question when I’m confused instead of just saying I don’t get it. And then right next to it I’ll have it annotated text or three stickies. So what I want the kids to see is here’s what we’re gonna learn today, here’s what we’re gonna practice and then here’s what you’re gonna leave for me so I can see if I need to help you some more at this or if you figured it out and we can move on. So we go over those learning targets in the opening structure and that usually just takes two or three minutes and then from there we go in the mini lesson and that’s really where I’m doing the targeted instruction based on the thinking that the kids left me the previous class period. Sometimes I’m teaching them a piece of content, sometimes I’m teaching them a strategy, sometimes I’m teaching them a skill. And it’s usually about ten to 12 minutes, the minilesson is. From there we’ve got a big block of work time which ends up being about 40 minutes right now. So during that 40 minutes they’re practicing reading or writing, whatever that mini lesson was that I taught. While they’re working I’m conferring and this is the best part and this doesn’t matter if you’re teaching 1st graders or seniors that conferring allows for that real time feedback – real time feedback is the number one thing that’s gonna close that achievement gap. So I’m conferring with kids while they are working, sometimes I’m pulling up small groups. And then before this cycle of workshop ends there’s opportunity for the kids to debrief. And then the debriefing they could be writing in their response logs or they could be working discussing in a small group. Or we could do a whole class anchor chart. But that whole debrief time is huge because it gives them an opportunity to meta-cognitive about what they worked on, how they got smarter about reading and writing for the day. It’s also that accountability piece that they know is gonna happen at the end of the workshop that I’m gonna say to them okay what did you guys do today, what did you figure out, how are you smarter now than you were when you walked in the door. Franki: So you ask that everyday? Nice. So how do you recommend teachers begin a reading workshop if they’ve never done so? Cris: I think workshop is – workshop is hard to do I think because for me it is so much easier for me to manage 40 minutes of lecture. I can hold people’s attention, I can snap my fingers and make sure people are quiet and on task. And so when you switch over to do workshop model there’s got to be a lot of planning up front about what the kids are gonna be doing during that work time. And that’s I think a big shift for teachers. It was to me. In the old days I used to plan what I was going to be doing. Now I’m planning what the kids are gonna be doing. So I would recommend that teachers look for people in their own buildings who are running their class in a workshop model. I think there’s a ton of great books out there that people can read that would kind of give them a picture of what workshop model looks like. Sam Bennett’s got a great book called That Workshop Book of course. I also think that going back to Nancy Atwell’s In the Middle ; I think that’s probably one of the best books, the most influential books that I read as a young teacher. So there are resources out there. I think you need to see what it looks like, read a little bit about it and then just kind of take a step, dip your toe in the water and start off with cutting back the talk time that you have and increasing that time that the kids actually get to do the work. I was thinking about my juniors and one of the anchor texts that the juniors read is The Great Gatsby . So I’ve got Chloe who is an avid reader but she doesn’t like to read classic literature; she likes to read urban fiction. But she’s a pretty good reader. I also have a student in that same class, Xavier, who is not a very good reader, he struggles, he’s got an IEP, he’s got delayed stress syndrome from an awful experience he had a couple years ago but I think I have to figure out how can he be exposed to The Great Gatsby as well. And so I wrote a little grant, got 15 iPods and I’ve been downloading – Pardon me? Franki: That’s fun. Fifteen iPods, that’s good. Cris: Yeah. So I’ve been downloading the novels on to those iPods and letting the kids who are struggling with the anchor texts read those, listen to the literature as well as follow along in their books. It’s been interesting because like Victor who will always use the iPod for the first couple of chapters and then he gives it back to me and says now he’s into the book to Xavier who is – his fluency is getting better, his automaticity is getting better, his vocabulary is getting better but what’s really cool is instead of him trying to fake read or just checkout he’s now participating in the discussions. He’s doing more of the written work and I think that for me is where this whole equity piece is coming in. It’s not a matter of gender or race or ethnicity. It’s this idea of are we letting all kids be exposed to great works. Cholea said to me the other day that she was in the dentist office and she said, “I’m just so proud of myself that I read The Great Gatsby . I was talking to grownups about it and I even told this one grownup that I read the book on my own.” And I just kind of laughed and I said that’s great. That empowerment – yeah. I think that with workshop model you’ve got that required text, you gotta figure out how to fit choice in but you also then gotta figure out how are you going to give kids of all levels access to great material. Not dumbing it down but are there other ways. And I think the more I learn about technology the more possibilities there are of really meeting those needs of kids who are struggling with the reading piece. Franki: Cris, your new work is focused on assessment. Can you talk about assessments that you do and how that really supports student learning? Cris: Well this new book that’s gonna come out in July it looks at workshop model as a structure for assessment. And I think for me the workshop allows me to collaborate with students and their meaning making versus catching them not knowing. And I think this fits in really well with what I’m learning about assessment. Being upfront with kids saying here’s what I want you to know and be able to do, here’s how I’m gonna assesses it. I’m gonna show you what I figure out and then together we’re gonna try and get smarter. And that’s a whole different way of looking at assessment than the way I was assessed. I think that teachers do not need anymore data. What they need are ways to use that data to help kids grow. And when I look at workshop model in every component of workshop model there is an assessment piece. The opening structure is a two or three minute time when I can tell kids what the learning targets are and how I’m gonna assess those learning targets. The mini lesson is a time for me to teach something specifically that kids need based on the work they left me the previous day. The kids get to work and while they’re working I’m conferring which allows me to differentiate instruction. It also allows me to give some real time feedback. And then that whole debriefing part is opportunity for kids to be meta-cognitive about their learning and self reflect. And I think as I read the research that’s what I’m realizing a lot of kids aren’t getting to do. They’re not getting to self reflect on what they did well and what they need to do next to get better. I think workshop model once again is just that system and that structure for allowing me to fit in all the mandates that administrators are expecting teachers to do. It allows me to fit in formative assessments, it allows me to make sure kids are doing more of the work, it allows me to differentiate instruction and if I don’t plan with that workshop in mind I end up just talking too much. Franki: You mentioned that we have plenty of data these days. How do you balance the assessment that really informs your teaching on a daily basis with the high stakes mandated testing that is taking up some times these days? Cris: Balancing the data is just how much data versus how you’re gonna use it is just so tricky. I think by the time students get to that secondary level there’s so many different assessments that the kids have to take. I’m really being selfish about the assessments that I do in my own classroom and they’re ending up being mostly formative assessments. They are things that allow me to see what the kids need right now so I can plan for tomorrow. So my students all have work folders and within those work folders is everything from the last nine weeks for a unit of study so they can see growth within that nine weeks. I have little files for each kid where I’ll collect a piece of annotated text quarterly, I’ll collect their summative data, I’ll collect common assessments that we designed in PLCs. I also have my conferring notebook where it’s not very fancy at all; it’s just quick notes whenever I confer with a kid so I can then go back and see what we were working on two months ago. I can show the kids hey this is what we talked about; how have you gotten better at it? I think the balancing between all this data is not waiting for the data coach to come tell you what you need to do next or the pacing guide to tell you where to go. I think the data has to be something that you can show a kid of where they’ve been, where they are now and where they need to go. And I think teachers have to take back control of that data piece a little bit more and not just be at the mercy of it. Franki: That’s smart. You keep mentioning student involvement in the assessment. Can you talk specifically about that piece? It sounds like you and your students are kind of talking back and forth on where they’re going next, where they’ve been, how they’ve gotten smarter. Are there things in place for you to do that? Cris: The student involvement piece is relatively new for me. I think within the last three years really starting to realize the kids have to be part of this. I know that sounds – I know I’m a little late in figuring that one out. But I think for them to care about getting better they’ve got to know where they’re starting at. I always talk about athletic coaches but they do this so well. At the beginning of the season they take stats on how fast kids can run, how high they can jump, they’re constantly going back and measuring that to see if kids are getting better. And I think there’s something in human nature that’s really gratifying seeing growth. And there’s this great quote by William Butler Yeats where he talks about you know happiness is not this, it’s not that, it’s merely growth. And I think that human beings want to know that they’re getting better. And for a lot of my kids and I think my struggling readers for years taught me this, struggling readers don’t really care about their data because they know it’s bad and they know they’ve never gotten any better. And so my goal is to show struggling readers – I want to give them the same rush that advanced students have. Really good students love taking tests because they always see how smart they are. So I want my strugglers to also see that they’re getting better and they’re getting smarter. So I’ve always been really open about any data that’s collected on the kids, any data that I’ve collected on the kids. And interestingly enough they’re more curious and more interested in knowing how they’ve done on test. They’re not as surprised. I think there’s something – we’re working together to get better. Aimee Buckner always has notebooks on her mind and we’re glad because she’s upping the nonfiction and modifying for specific learners’ needs. She’ll tell you more in this podcast. 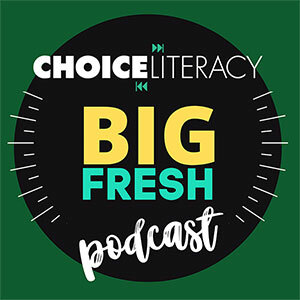 Franki Sibberson chats with Chris Lehman and Kate Roberts about close reading in this 30-minute podcast. Chris and Kate are the authors of Falling in Love with Close Reading: Lessons for Analyzing Texts — and Life from Heinemann.